Sorry if unclear, I was expanding on ChamberOfFear's answer to explain the reason for/benefit of the update. I was installing AGS v3.4.1 (latest stable). Doing so required me to install .Net 2.0 first. However, 2.0 isn't actually available as a standalone any more: you have to install 3.5, which includes 2.0. The whole process is therefore a bit confusing. I assume that with 3.4.2 I would just have been able to install AGS without any other steps. Oh, okay, I thought there was some problem with this version. First of all, congrats for those new cool features! The Dark UI theme and the ability to lock room's layers and individual items brings lots of comfort! Great job! 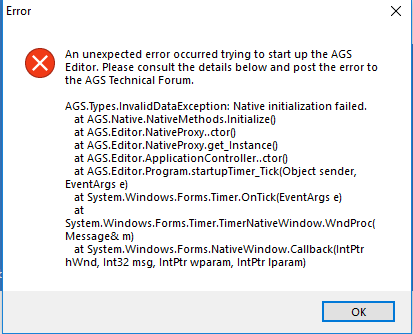 Quick question: as this new alpha focus mainly on the editor and save games, is a game made with this AGS 3.4.2 - Alpha 1 would still be compatible with AGS 3.4.1 - Patch 1 (the latest stable version)? If not, would you think it's reasonable to start working with this alpha (I guess games made with this version will work on the forthcoming stable AGS 3.4.2)? I worked with a lot of beta versions previously (from the Custom Resolution build based on 3.3.0 / 3.3.1 to 3.4.1 - Beta 7) and never had any problems or crashes with those versions. Thanks a lot - and again, congrats for your fantastic job! Lancelot's Hangover : A whole life to find the Holy Grail. One alcohol night to lose it. Hmm, somehow I missed this last post in March. If you mean, whether it is possible to move back from 3.4.2 to 3.4.1, then probably yes, for now, because there were not any changes to game format. But there is no guarantee that this will remain so. I guess that this release may be pretty stable. Actually I just removed "unstable" word from the title, because it may confuse people to think that it is crashing, etc. It's WIP, but should be relatively safe. Then again, even the releases that we call "stable" do have mistakes sometimes. Also, in theory there are always ways to move your project back to previous version of AGS. I'm building my MAGS on this version, and I just noticed the manual isn't included in the zip... At first I thought I had accidentally deleted it, but then saw it's not included in the zip... no big deal, I'll just open it from a previous version... just wondered why it wasn't included (morganw suggested it might be cause it's an "unstable/WIP" version...). Just thought I would mentioned it. The most logical reason is that I forgot to copy the file there. Great job CW as always. Is there a limit of number of module scripts you can create ? Sorry if it was removed before. I couldn't follow it on the previous versions. Is there a limit of number of module scripts you can create ? Sorry if it was removed before. I couldn't follow it on the previous versions. It was removed, back in 3.4.0 I think. Hi. Our names are FRIGGING ADORABLE. I'm too close to launch to update to this WIP version. But hypothetically speaking, if I later decide to upgrade, saves created in 3.4.1 should be compatible (assuming I don't do anything that breaks saves)? That's amazing. But hypothetically speaking, if I later decide to upgrade, saves created in 3.4.1 should be compatible (assuming I don't do anything that breaks saves)? 3.4.1 --> 3.4.2 saves are compatible, because we are keeping legacy save format for some time, in case someone upgrades the actual game or moves to the new version of engine port. 3.4.2 --> 3.4.1 saves are NOT compatible. Yep. That's what I'm talking about. Sweet. Thanks! I still did not have a chance to look into the reported bug about characters not displayed in the room editor until you reload the room. - Editor preferences are now stored using .NET configuration model, instead of the Windows registry. - Added "Export mask to file" tool button to the Room Editor. - Added "Always"choice to "Popup message on compile" preference. Successful compilation popup will only be displayed if "Always" choice is selected. - Fixed sprite folders collapsing after assigning sprite to a View frame or an object. - Fixed view loops displayed with offset if the view panel area was scrolled horizontally prior to their creation. - Fixed TextWindow GUI's elements could be deleted or moved in the editor with key controls. - Expanded some of the error messages providing more information to end-user and developers. Interesting! Does it behave any differently, or is it just a matter of performance? Perfomance mostly, it is way faster, but requires few extra MB of memory to build a nodes grid. Probably latter could be optimized on per game basis by implementing some options. It also fixes certain bugs AGS had with complex walkable areas with lots of curves, but that's may also be because the list of of checkpoints was increased. Do I need anything additional installed for this alpha? 1 file was missing, reuploaded. The clickable areas on the new-fangled object/character/everything selector bother me. They're too small to navigate quickly. I get that it's based on the Windows Explorer address bar, but that is arguably a secondary navigation bar (and I've never found it the mouse navigation intuitive). Could we have the name and the arrow be one clickable area that shows a menu? The name currently makes it possible to navigate back up the hierarchy, but I don't think that's needed. i.e. There's no specific view associated with having "Room" selected on its own. I don't know, what do other people think? Yes, I wanted to suggest this too. I test it now. New pathfinding is cool. It's similar to way system now. Performance is better too. It's a great update. Thanks a lot guys. Page created in 0.141 seconds with 28 queries.